Gov. Chris Sununu appeared on NHPR's The Exchange on Dec. 20, 2018. Governor Chris Sununu says he's planning additional support for towns and cities in the form of one-time payouts in his state budget proposal. He says such local investments are possible thanks to a strong state economy. 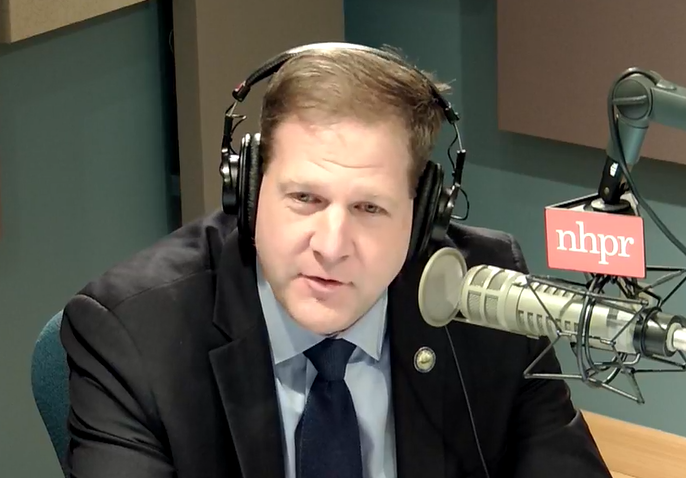 Sununu discussed his 2019 priorities today on NHPR's The Exchange. His comments were in response to a listener's question about the state "downshifting" some financial obligations to local government—Sununu responded that, unlike some past administrations, he had not downshifted a single dollar to towns or cities. He will deliver his budget recommendations to the Legislature in February. He did not specify his proposed one-time funds to direct to towns and cities. The current budget included $35 million to schools for building and security improvements and $30 million for towns and cities to pay for road and bridge improvements. He says those one-time funds give towns and cities more financial flexibility, which is key if there is an economic downturn over the next year. The Republican from Newfields will enter his second term with a new political landscape: Democrats captured majority control of both the House and Senate. Sununu says he's heard he is the first Republican governor since the Civil War to have a Democrat-led New Hampshire House and Senate. He said on the show that he had lunch last week with former Gov. John Lynch, a Democrat, and he asked, "So, how did you do it?" On January 3rd, Governor Sununu will be sworn in and officially begin his second term. This time, the Republican governor will have to work with a Democratic State House, Senate, and Executive Council. We'll talk about that, and issues from health care to taxes to the environment.